Extra wall insulation is easier to add in the basement, crawl space and attic because foundation walls and attic areas are easily accessible. And these areas are the most likely to be uninsulated or very poorly insulated. Dr. Energy Saver offers Free Estimates on wall insulation installation for your home. 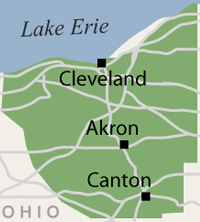 Our company services Akron, Cleveland, Canton and surrounding ares such as Massillon, Elyria, Lorain, Strongsville, Lakewood, Chagrin Falls, Medina, Hudson, Cuyahoga Falls, Ravenna, Bedford, North Royalton, Westlake, North Olmsted, Wooster, Painesville, Alliance, Kent, North Canton, Beachwood, Barberton, Willoughby, Gates Mills, Stow, Brunswick. Dr. Energy Saver can assess wall insulation levels throughout your house and recommend insulation upgrades that will significantly improve home energy efficiency. Dr. Energy Saver will then complete the custom home energy efficiency improvements you have selected. It's tricky to insulate finished walls. Wall insulation is easy to install when the studs are still visible, before wallboard or other finished wall material is installed. Once the wall is finished, it's more difficult to get insulation inside the wall, in the cavities between studs. One technique for insulating finished walls involves drilling access holes near the top of the wall, and blowing cellulose insulation into empty stud cavities. Air-sealing is the first step. Whether the exterior walls of your home are well insulated or not, there's a very affordable way to improve their energy performance along with your comfort. If you can feel cold air coming into the house around electrical outlets and window trim on a cold winter day, your walls probably need to be air-sealed. This energy upgrade seals the many cracks, gaps and holes where air leakage occurs. Dr. Energy Saver contractors offer Free Estimates on wall insulation installation in greater Medina, Massillon, Lorain, Elyria, Strongsville, Chagrin Falls, Lakewood and Elyria, Lorain, Medina, Massillon, Lakewood, Chagrin Falls, Strongsville, Hudson, Cuyahoga Falls, Ravenna, Bedford, North Royalton, Westlake, North Olmsted, Wooster, Painesville, Alliance, Kent, North Canton, Beachwood, Barberton, Willoughby, Gates Mills, Stow, Brunswick as well as many other local Ohio areas. Save Energy and Money With A Wall Insulation Installation Upgrade.